Before joining Bike Fort Collins, Chris held key executive, technical, and communications positions, and led bid-writing for the 2013 and 2015 USA Pro Challenge NoCo stages. He’s long been active as a leader in the NoCo cycling community, directing Northern Colorado Cycling Events, co-managing First City Cycling Team, race directing the City Streets Criterium series, and developing sponsors for a number of grassroots events, including the 2013 Fort Follies Women’s Grand Prix. He’s also hosted countless community events including seminars and town hall meetings and is creator and co-host of the long-running YGR Live Bike Talk Show series. 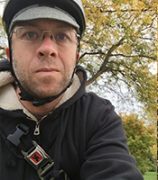 He’s a car-free all weather commuter, recreational endurance nut, retired Cat 2 roadie, and former Chicago bike messenger.